Posted on Thursday, March 6th, 2014 at 10:40 am by Pieter van der Westhuizen. Microsoft InfoPath makes it relatively easy for end-users to design XML-based forms. It is also a stress-free way for users to design forms that can connect to databases, XML schemas or even to SharePoint Lists. Earlier this year, Microsoft has also announced that it will discontinue InfoPath to pursue a more integrated experience for Office forms. So look out for some InfoPath features being integrated into Word, Access and SharePoint in the future! Although InfoPath is at the end of its life, it doesn’t mean people will stop using it right away, so there will still be room for writing an add-in or two. We all know when it comes to writing add-ins for any product in the Microsoft Office suite that Add-in Express is the toolset for the job. Let’s have a closer look at each of main InfoPath objects one by one. The first two Application objects have been superseded by the _Application3 object and merely remain in the object model for backward compatibility. For any new InfoPath add-ins, use the _Application3 object. 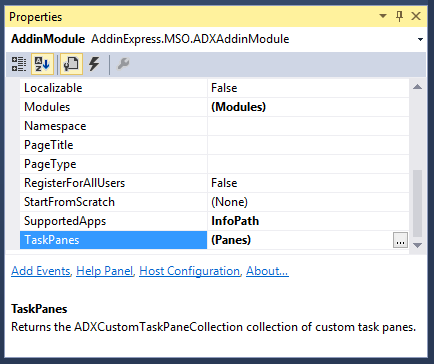 Add-in Express automatically takes care of this for you by adding a property to the AddinModule class that references the correct Application object. The XDocument object is an important object in the InfoPath object model as it can be used to programmatically interact and manipulate the XML source of the InfoPath document. You can access the XDocument object by referencing the XDocument property of the ActiveWindow object. The ActiveWindow object is a property on the Application3 object. To iterate through all the fields in an InfoPath Form, you’ll have to use the DOM property of the active XDocument object. An InfoPath form is essentially an XML document, so looping through its fields involves looping through the child nodes of the forms’ document element. Setting the form field values, is done in a similar fashion as you would set element values in an XML document. You can get a reference to a specific field’s node by using the getElementsByTagName method of the IXMLDOMDocument object. In this example, we’re using the Travel request template and setting the purpose and name fields. Like all of the applications in the Microsoft Office 2013 suite, InfoPath 2013 also supports the Office Ribbon UI. To add your own ribbon tab to the InfoPath window, you first need to add a new ribbon tab control (ADXRibbonTab) to the AddinModule designer surface by clicking on its corresponding icon on the AddinModule designer toolbar. 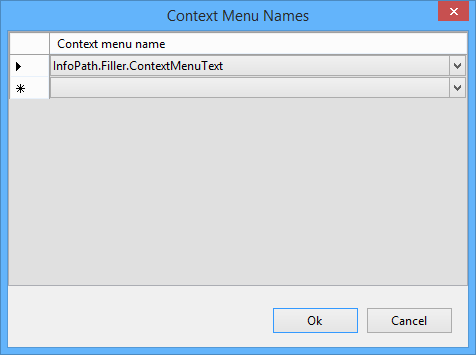 Add-in Express also makes it easy to add your own items to the built-in context-menus of InfoPath by providing an ADXRibbonContextMenu component. After adding this component to the AddinModule designer surface, you can design the context menu items using the built-in visual designer. You’ll also need to specify the ADXRibbonContextMenu’s Ribbons property. By setting it to InforPathFiller, your custom context menu will only be visible when the user is completing the form, not whilst the form is being designed. Office Task panes are a convenient way for users to use different commands and to perform various tasks. It also provides developers with a way to display more information and show a larger UI than they are able to do with the ribbon UI. MS InfoPath also supports custom task panes and Add-in Express similarly enables developers to quickly and easily create their own task panes. 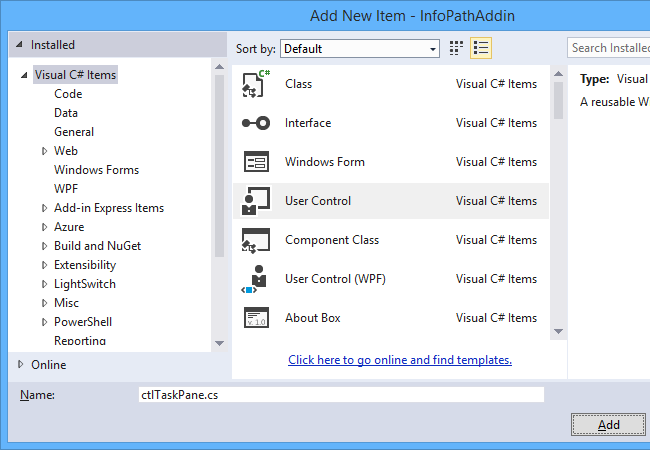 To create your custom InfoPath task pane, first add a new Windows Forms User Control to your project. You can design the user control as you would a standard windows form. After you’ve designed the task pane, select the AddinModule designer surface and click on the ellipses (…) button next to its TaskPane property. SupportedApps – One task pane can be used in multiple Office applications. To only use it in InfoPath set this property to InfoPath. Lastly, we’ll take a look at how you can add your own items to the File menu or rather the backstage view of InfoPath. 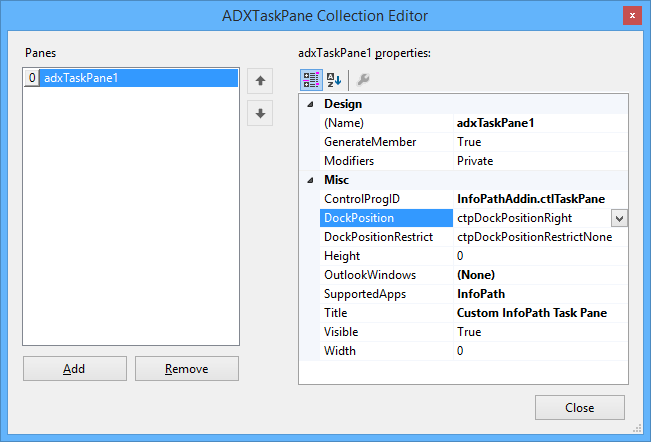 In order to add your own items, you first need to add an ADXBackstageView component to the AddinModule designer surface. Add-in Express provides a powerful visual designer for the Office backstage view, with which you can design a large variety of different layouts.